This question automatically activates our hippocampus and transports us to our childhood where one day we learned the planets of the solar system: “Mercury, Venus, Earth, Mars, Jupiter, Saturn, Uranus, Neptune and Pluto.” All this only altered by the grand finale of Pluto, our subsequently banished distant planet. 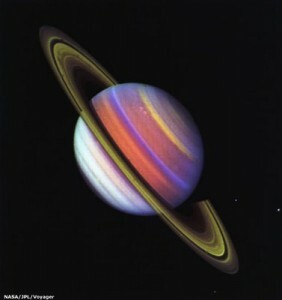 The 9 planets of the Solar System where it appeared, may have included the image of Saturn in false color (see afterwards that it was a composition of green ultraviolet light and violet) taken in 1981 by the space probe NASA ‘s Voyager 2 (see photo right). Since the discovery the last and most timid on the list (Pluto) was back in 1930, one wonders how planets are discovered. An important detail of the discovery of Pluto it is that, as usual in astronomy, it was not by chance. The search for Pluto was a result of the discrepancy between the observed position of Neptune and the theoretical position of accurate astronomical calculations. In fact, some similar calculations eight decades ago by John Couch Adams and Urbain Le Verrier independently, led to the discovery of Neptune, which also seemed somehow alter the orbit of Uranus. The discoverer of Pluto, who changed the long standing list of planets, was Clyde Tombaugh. From the Lowell Observatory in Arizona he discovered the slow movement of the icy dwarf and ran out giving it the name of the god of the underworld. He used this device, known as blink comparator, which is a completely obsolete in our modern times. If someone wanted to see live a living relic of this device can be found in the museum of Lowell Observatory (pity there is not one in the collection of the National Geographic Institute). Another story of Pluto is that of a girl of 11 years. Specifically Venetia Burney (pictured), a student at Oxford at that time who proposed Pluto as possible name for the newly discovered star. I can not end this first entry without mentioning the fall of Pluto of Olympus in 2006. The IAU decided that Pluto should no longer be a planet because it was too different from the others. In particular it is too small and far away. Possibly the straw that broke the camel’s back was the discovery in 2005 of the trans – Neptunian object Eris, which is actually larger than Pluto. This forced the IAU in 2006 redefined the term planet, to prevent about 25 objects similar to Pluto from being classed as planets. I guess kids today can thank the IAU to spare them memorize more than 30 planets! In conclusion, Pluto since 2006, along with 4 other colleagues (Ceres, Eris, Makemake and Haumea) have been classed as dwarf planets, and as a result, the number of planets that hypothetical children present should memorize (if educators do not believe too stressful) is eight. So (for now) the answer to the title of the entry is eight . In my next post we will go a little beyond Pluto to see how planets of other stars are discovered.